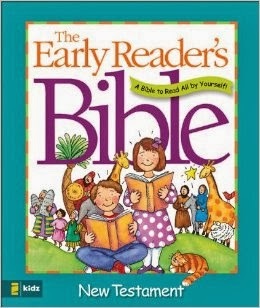 Stephen and I just finished reading through the 29 New Testament Bible stories presented in "easy reader" vocabulary in The Early Reader's Bible New Testament by V. Gilbert Beers. I suspect this version is out of print, as I got mine second hand on Amazon. However, the full bible version is available new. Before I launch into how this Bible went over with Steve, I should clarify that this kids' Bible is written with a very limited vocabulary-- drawn from school standard lists for beginning readers. The stories, which are about three short pages long, introduce no more than five new words each. Comprehension and discussion questions follow each story. The paperback is lightweight and small enough to bring on trips without adding a ton of weight to Stephen's backpack. The stories are simply written, so I didn't really have to paraphrase (though at times, I had to enrich with extra details to make them more interesting). The comprehension questions showed me how much Stephen was (or wasn't) absorbing. Some of the stories included were less commonly included in children's bibles: The parable of the rich fool, Satan tempting Jesus for 40 days in the wilderness, Philip and the Eithiopian Eunich, Paul's writing to Philemon on behalf of Onesimus. Also, it included Mary's conversation with the resurrected but not yet ascended Christ. Stephen seemed to like reading this at first too. We could often read a few stories per night. When he was very sleepy, one story was quick enough to squeeze in. The discussion questions seemed to lead the same answers every time: Show God you love Him by telling others about Him, singing songs to praise Him, being good etc. This is an excellent message to drive home, but I think Stephen's eyes glazed over pretty quickly when it came to life application. He always wanted to discuss the story itself in more depth. Terri Steiger's artwork, while plentiful, was not really my style. The figures all look kind of lumpy and overtly angelic or lumpy and overtly naughty. On the plus side, the rather nondescript illustrations did not distract Stephen from the story...something that tends to happen with a lot of other books we read. There is also a significant lack of multicultural faces in the life application pictures. This is a good story bible to get for cheap (I got mine for a penny plus 3.99 shipping off Goodwill) if you've got a beginning reader or a listener with a short attention span. It contains a good selection of New Testament stories, which is great if you're like me and often start reading children's bibles at Adam and Eve and then rarely make it to the New Testament.